In Mastering Formative Assessment Moves, Brent Duckor and Carrie Holmberg elaborate specific instructional moves to help both novice and seasoned teachers deepen their formative assessment practices. Their vision is not to be added on top of other reform initiatives but fits perfectly within equity-focused, ambitious teaching practices aimed at deeper learning. I like that the authors push back against quantitative indicators as the best means for tracking learning progress and offer ways, instead, for triangulating and building upon qualitative windows into student thinking. For two full decades, formative assessment's prevalence in our schools has fallen far short of its proponents' predictions—particularly given the research evidence supporting its effectiveness. Drawing on their own experiences as practitioner-researchers, Duckor and Holmberg have come up with a marvelous set of implementable guidelines, for both prospective and seasoned teachers, showing how the formative assessment process can sparkle. An insightful, wise, and highly usable guide to formative assessment that draws from research and is inspired by the wisdom of practice. Emphasizes how assessment as an integral feature of high-quality teaching draws upon deep content knowledge and goes well beyond mere technical skill. The book is the enlightened collaboration of a practice-enriched teacher educator with deep roots in secondary school reform and a superb board-certified (and renewed!) teacher and teacher educator from a newly minted doctoral program. Mastering Formative Assessment Moves offers educators a rich, new conception of practices that can help bring the process of formative assessment to life in the classroom. Rich with guidance, research rationale, examples, and "do now" activities, the book makes the invisible visible in seven high power moves that can fuel educators' journey to being expert formative assessment guides, guides who open up "new worlds of classroom learning and communication (p. 4)" for teachers and students alike. Kudos for a very thoughtful approach! Whether you call it assessment for learning or formative instruction geared towards deeper learning, Duckor and Holmberg have given us a great resource—with their new model and their inviting terminology for making pedagogical life for students in today's classrooms more meaningful, relevant, and effective. Teachers who didn't "get it" in previous encounters with formative assessment will with this innovative approach. My advice to teachers and professional learning coaches in language arts and literacy is to implement this new, sensible framework without hesitation. The compelling research of formative assessment and its significant effectiveness on student learning has been well documented for over twenty years by Black, Wiliam, Thompson, and many others. Yet, there still exists a large implementation gap between the educational research and typical classroom practices. Duckor and Holmberg have contributed an additional resource to teachers to make sense of their "moves" by offering a framework to unpack and examine instructional and assessment practices—minute by minute, day to day in their classrooms. By reframing how we understand and discuss formative assessment, and illuminating the nuances and interconnectedness of high leverage instructional and assessment moves, Duckor and Holmberg have invited our field to reenvision formative assessment as critical to equitable teaching practice. Collaborating and weaving a new narrative around assessment brings us closer to authentic student learning and teacher efficacy. Years of research and practice has yielded insights into the power of formative assessment to transform educational outcomes. In this innovative and highly readable book, Duckor and Holmberg use rigorous academic standards—rooted in the Habits of Mind—with a deeper focus on instructional effectiveness by offering practitioners intuitive strategies to engage in real-time formative assessment moves. Program researchers, content experts, and policymakers can build on the capacities and skills these scholar-practitioners have suggested to further support assessment for learning. Teacher educators know formative assessment makes a difference. We have worked to embed it in our university coursework, professional standards, teacher performance assessments, and licensure frameworks—now we have a book that guides our candidates, cooperating teachers, and university faculty in how to make formative assessment happen for beginners! The authors have performed a rare feat—they explain the "why" of formative assessment at a high level, but Duckor and Holmberg also get into the nitty gritty of actual classroom level practice. Educators, both new and experienced, will find much they can use here. No teaching skill has ever had a greater amount of supportive research and laudatory testimony than formative assessment. It absolutely must become part of every teacher's repertoire of skills, and this admirable book tells how to accomplish that. It may be a game changer for the field. Any effort that takes assessment of instruction out of the hands of distant corporations and politicians and places it in the hands of teachers is to be applauded. So, give it up for Duckor and Holmberg! Quick fix assessment technologies have increased our appetite for easy solutions to complex learning problems. 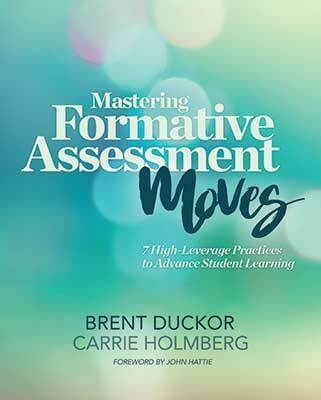 In Mastering Formative Assessment Moves, Duckor and Holmberg provide a necessary and helpful mix of instructional insights, practical tips, and research on assessment for learning. The chapters highlight a critical insight for teachers and teachers of teachers: in order to help move students along their domain-specific learning progressions, teachers must recognize that they, too, are on a formative assessment learning trajectory. Duckor and Holmberg have written a remarkable book, one that connects specific classroom practices of high quality formative assessment with broader democratic goals of public education. Immensely helpful to teachers and students, the book links vital questions of critical pedagogy to the ways that formative assessment promotes skills of critical inquiry for all students. It will, I believe, influence our current discourse about assessment, educational opportunity, and equity in learning. Rarely do we see the advances in nationally recognized assessment design and the principles of classroom evaluation woven together in a handbook for teachers, counselors, principals, and district leaders who seek agreement on what matters most—deeper learning, better assessment strategies, and more effective ways to improve student achievement. Duckor and Holmberg have given us a glimpse of how to get stakeholders on the same page, moving the field a little closer to consensus on why formative assessment is essential to any school improvement plan. This book it is an important contribution to both teachers in the field and to research on teaching and teacher development. Duckor and Holmberg's "7 Moves" framework contributes to defining "good teaching" from a teacher development perspective, thus helping shape the emerging concept of a "teacher learning progression," particularly for those seeking to better understand teachers' work in primary and secondary schools. Teachers and researchers in the United States and abroad will benefit from a close reading of what it may take to better capture indicators of professional growth in high leverage practices related to formative assessment. Brent Duckor and Carrie Holmberg show the importance of formative assessment to effective teaching and bring to life how teachers can learn to do it well. Clearly grounded in research, this book is full of practical examples and concrete strategies that will stimulate teachers to think hard about formative assessment and, no matter where they are in their professional career, to develop their formative assessment skills for the benefit of all students. Mastering Formative Assessment Moves is a theoretically sound and pragmatically well-crafted vision of learning and assessment as a mutually constituted, continually evolving dialogue. The crafts of teaching and assessment are powerfully intertwined and grounded so that the promise of a progressive education is renewed and revitalized. Perhaps most important, the interplay between learning and assessment featured and consistently exemplified throughout this volume describes a new accountability, oriented toward thick descriptions of student learning that can help practitioners envision productive pathways for instruction.